More about my Taiwan grad trip way back in 2007 and travelling with my friends, collectively known as the Unholies. We had just arrived in Taipei the day before and were now looking to explore more of Taipei’s natural sights on a day trip around the capital. We headed to Yang Ming Shan by catching Bus 260 from outside the Taipei Main Railway Station. The trip takes about an hour and drops you off at the YMS bus terminal, where you either hike around or take another bus to get around the place. YMS, to put it simply, is an old people place; other than us, everyone else on that bus (and that mountain) was old. Personally, I thought there wasn’t much to see there, but according to the YMS website here, it’s more an R&R location than anything else. You can hop on the bus that brings you around there, but it comes every hour so there really isn’t that much time flexibility. Add the super winding roads and crowds and the fact that you can’t very well let old people (which is EVERYONE else) stand, that means you end up standing in the bus all the way. Taking a nice little hike. We weren’t particularly prepared for wilderness in our casual wear! You could hike around the place though, which is what we decided to do to reach the visitor’s centre from the bus terminal. There is an interesting anecdote about a snake encounter as we were hiking along one of the paths; I thank my sharp reflexes for propelling me forward and avoiding the snake (I still remember my quick glimpse of the snake – dark brownish with white vertical stripes) as it ended up going over C’s foot. We grab some maps from the visitor’s center then hared off to catch the bus. We drop off first at Xiao You Keng, which is a pretty desolate spot – it was so quiet after the bus trundled away! 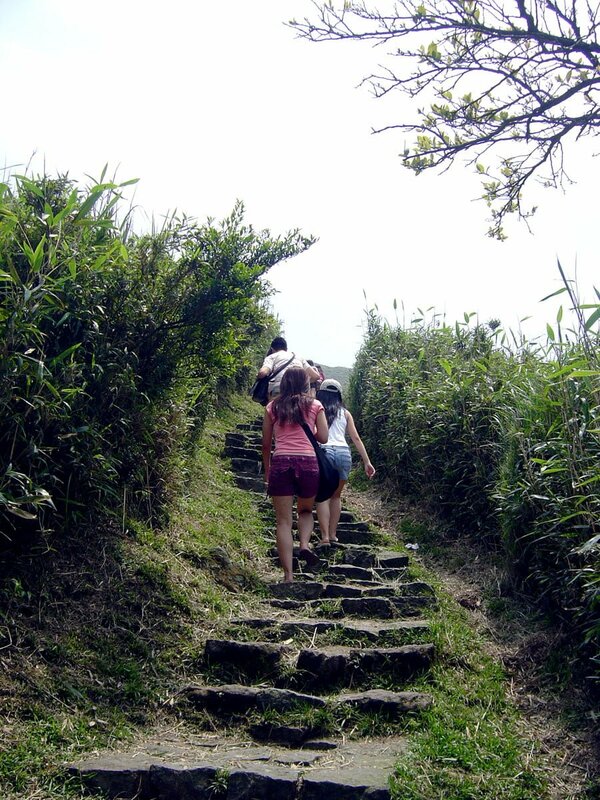 There was a super stair trek to climb and it was pretty scenic, but it was way too hot and we weren’t prepared for extensive trekking in slippers and shorts, so we (me mostly) gave up quick and seeing the next bus in the distance, we made another dash for the bus and headed to our next destination Leng Shui Keng. Leng Shui Keng is where the hot springs are and they’re supposed to be pretty good, but as luck would have it, they closed for cleaning just when we got there. 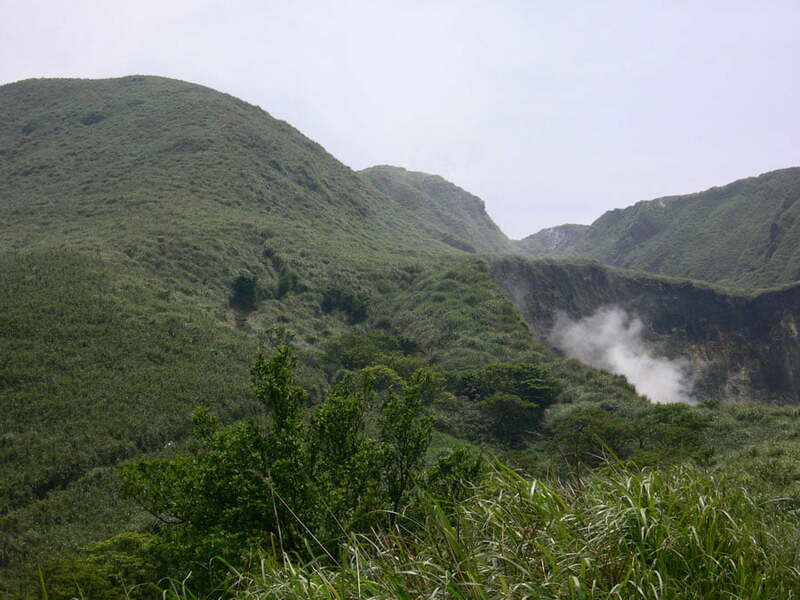 Kinda small looking too so we decided to head down to the hot springs at nearby Bei Tou instead. 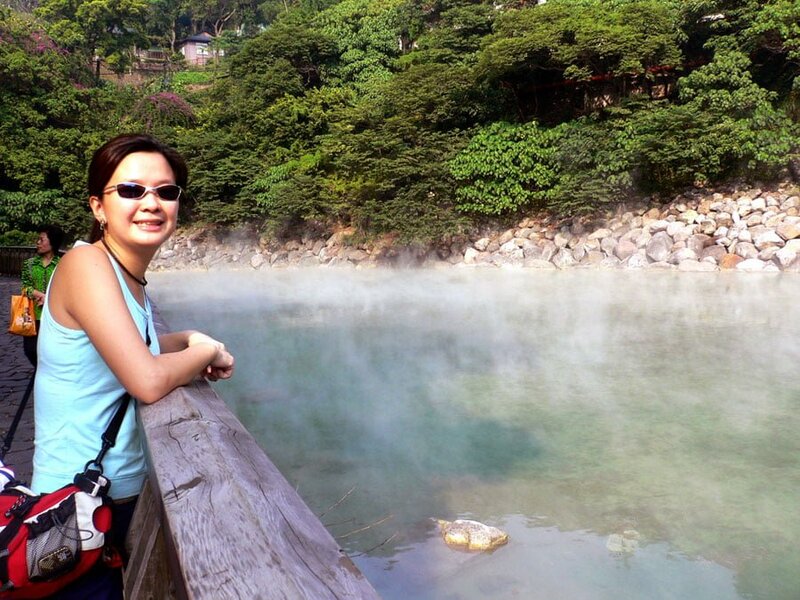 Bei Tou is the hot springs area of Taipei. We took a bus there from YMS, but it’s also along the MTR line (Xin Bei Tou, off Bei Tou station). Unfortunately, we reached the public baths at their cleaning time (it was a day of bad timing!) , so we headed to the Hot Springs museum just down the road to pass some time. The museum was quite interesting – The upper level is Japanese inspired, while the lower level is Western inspired – little old ladies act as tour guides, and its not a bad way to learn more about the history of Bei Tou and about hot springs in general. These special upwards tilting shoes are apparently good for your body and spirit in all sorts of ways! Soaking in hot springs seems to be a very old-people activity. 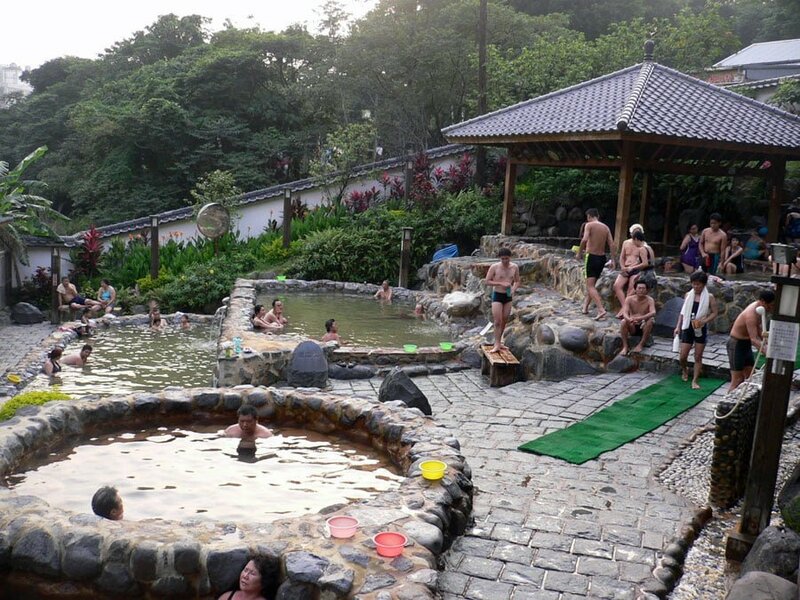 We visited a number of hot springs throughout Taiwan, and one thing we noted was there were hardly any young people soaking in the public pools, unless their age was a single digit and they were being babysitted by their grandparents. The hot springs were crowded! They tend to be right after opening as that’s when the water is ‘cleanest’. We chose the public baths because it was the cheapest and easiest option – the public baths are unisex and let you wear bathing suits (no T-shirts, only proper bathing wear). They’re open air so it can get hot on sunny afternoons; there are 4 pools of increasing hotness (Level 4 is so hot it’s PAINFUL) and 2 cool pools which I spent most time in. After that we headed to nearby Danshui at the north end of the MTR line (only a few stops from Xin Bei Tou). It’s a harbour bay area and an old town area. There’ s a ‘new town’ area across the road with more shopping – I bought a frilly umbrella there – but we hung around mostly at the old area. It was so hazy that there was no sunset, so we didn’t bother going to Fisherman’s Wharf and the Lover’s Bridge. Didn’t do very much here – spent most time eating the Taiwan Street Food. I love fried mushrooms and Lu Rou Fan (rice with braised pork. It’s pretty cheap, like 20-30NT per bowl and very simply, but i love it), yumyum. C, P and K entertained themselves at the Ripley’s museum (weird things in there), but I opted out and just chilled out enjoying the night sea breeze with J. 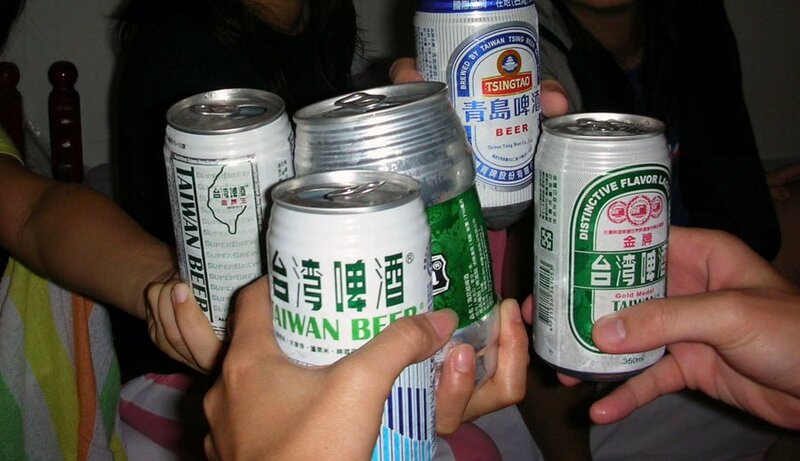 We had an early night, decided to sample Taiwan Beer (which isn’t great – the China Tsing Tao was the best of the lot) and turn in for the night. 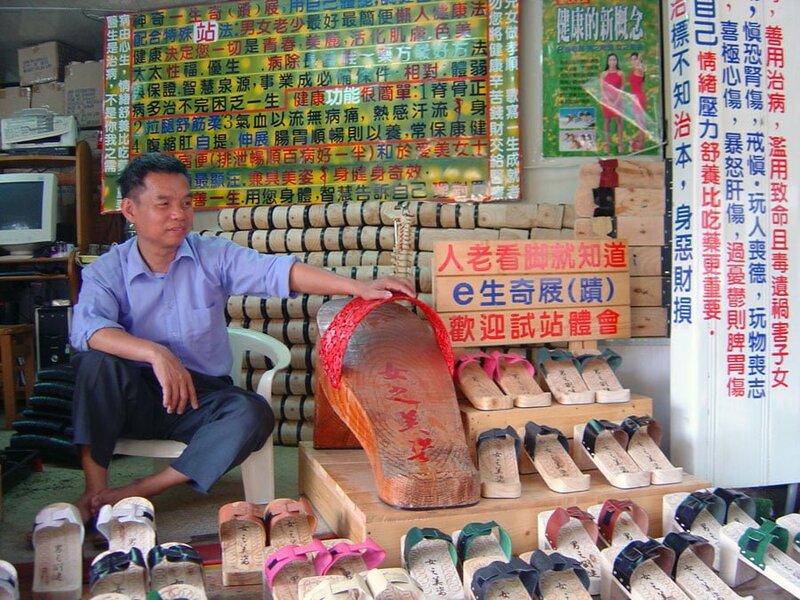 We would return to Taipei again at the end of our trip – that’s when the shopping really begins! In the meantime, it was time to rest for our trip to Hualien the next day! 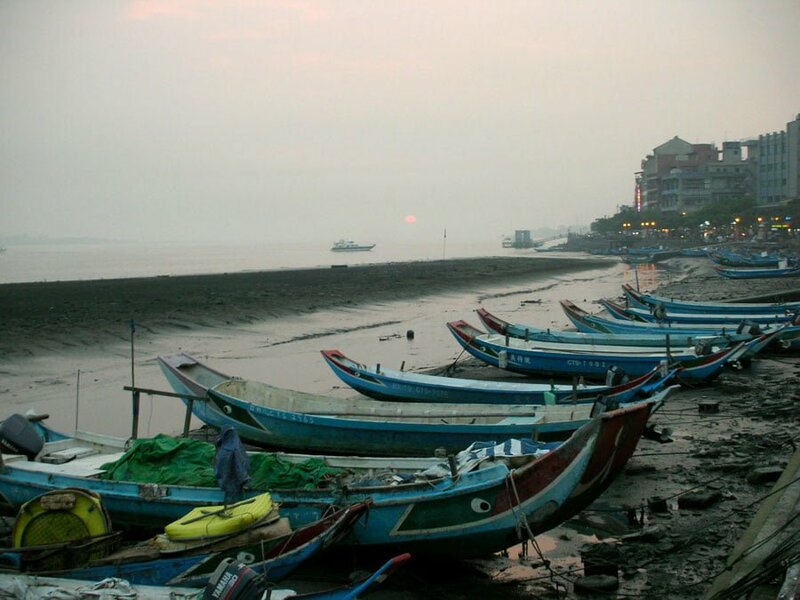 See all the daily journal entries from this trip to Taiwan back in 2007. Or see all my Taiwan posts if you are looking for tips on visiting Taiwan and where you can check out beyond Taipei. and is alot places to cover within a day!